Trinity Sunday (this year May 27) is a special Sunday with the main theme of God being one God in three persons. How can that be? How can God be “one God” – clearly stated in the Bible – and also be known to us as three distinct persons, Father, Son and Holy Spirit? The quick answer is that heaven is not restricted to our three-dimensional and humanly logical worldview. This is an exciting truth, and not so perplexing if we look at it from above, rather than from below. 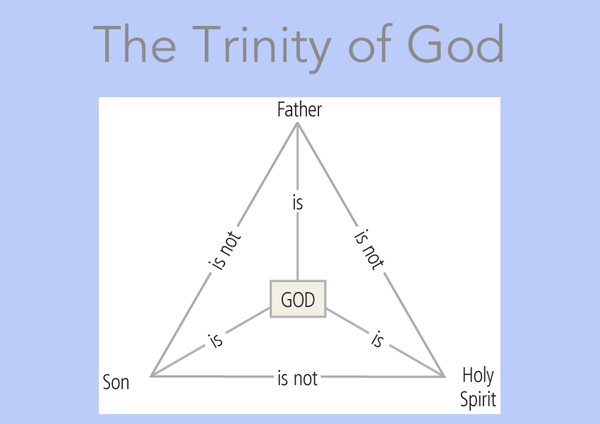 This article on Understanding the Trinity of God goes into a little more detail and offers an explanation. The Bible readings for May 27 begin with Isaiah’s call as a prophet, in the context of Isaiah needing to become a spokesman for God to the Israelite nation which is growing increasingly self-sufficient and proud. As one of this wayward nation, how can Isaiah respond? The answer comes as an angel symbolically purifies his speech with burning coal taken from the place of sacrifice and the voice of the Lord is heard to ask who He can send, and “who will go for us”. Is this the royal “we” or the trinitarian “we”? The psalm adds little to the theme, but the Gospel reading in John 3 contains some of the clearest and most essential truths of what we call the Good News. Jesus makes it clear to Nicodemus, the learned and aristocratic Jewish teacher, that despite such good religious credentials he must have anew spiritual start to experience the reality off the kingdom of God. Jesus says to him, and by extension to each of us, “You must be born again”. Nicodemus states his position as one of the Pharisee sect saying “We know…” and goes on to acknowledge Jesus ad teacher and worker or miracles. Jesus replies with His own “we”, saying with great emphasis “Amen, amen…we speak of what we know, and we testify to what we have seen”. He is delivering a vital and incontrovertible statement of truth delivered jointly from the Father, from Himself, the Son, and from the Holy Spirit. The NT epistle reading from Romans 8 reinforces this change from the realm of the flesh to the realm of the Holy Spirit and human spirit which was the nature of the new birth and spiritual empowering of believers in the Early Church. The Holy Spirit, the Spirit of God and the Spirit of Christ is here a little like an old-fashioned aristocrat with several titles, which adds to our understanding of the Trinity. The teaching of the passage adds to our understanding of the new identity we gain as children of God and also heirs as a result of our spiritual transformation. Jesus said, “You must be born again”. Paul says that you will know a new and special intimacy with the Father as part of the new identity you come into, when you give your life to Jesus and open the door to His Spirit. A vision at a time of national crisis, King Uzziah’s death in 740 BC. The prophet’s own experience of being called follows a long introduction about Israel’s call to be pure, righteous people through whom other nations would learn God’s ways. But his question is, how could such a perverse and proud people fulfil such a call? His own questioning about his own suitability to be called is the same question scaled down and made personal. “I saw the Lord” – No one has ever seen God, because God is Spirit, John 1:18, 4:24. However, at times He clothes Himself with visibility, as here in Isaiah’s vision, or Joshua’s challenge, Josh. 5:13–15. 2 Above him were seraphim, each with six wings: with two wings they covered their faces, with two they covered their feet, and with two they were flying. “Seraphim” – the word suggests that they looked like flames. “Covered their faces” – even heavenly creatures could not look upon holy God and covered their faces. “Unclean lips” – or unholy attitudes. Apparently not – but Isaiah is comparing himself to holy God, and reflecting on his guilt by association. “The King” – Uzziah has died and Isaiah has glimpsed the real Almighty King. “Live coal… from the altar” – God has provided a way for the sin and guilt of humankind to be put right, taken from the place of sacrifice. This is symbolic of the final and perfect sacrifice to be provided by God in Jesus, to take away the sin of the world. “Go for us” – plural as in Genesis 1:26, 11:7. One of many implied references to the Trinity, and an allusion to God speaking in the presence of angels, the heavenly council, 1 Kings 22:19-22, Jeremiah 23:18, 22. We may find it difficult to believe that Almighty, majestic, holy God would deign to speak and offer guidance to us. If Isaiah, a humble and holy man and renowned prophet, felt unworthy in himself and as part of the proud people of his time, what kind of audience can we expect? The answer is that we have a new identity in Christ, clothed in His righteousness and with the rank of sonship, no less, conferred upon us. We can enter into the courts of heaven because they know who we are! What sort of reception do we get from the council of heaven, the angels that surround the throne? What is the conversation of heaven? Of course, we can go right up to the throne of God the Father, but there is something encouraging for us in this picture of meeting God via the plurality of heaven and its complete unity. What sense do you have, perhaps a beginning sense, of heaven calling you? What might the council of heaven be saying about the nature of that call and their choice of you? 2 Ascribe to the Lord the glory due His name; worship the Lord in the splendour of his holiness. 4 The voice of the Lord breaks the cedars; the Lord breaks in pieces the cedars of Lebanon. 1 Now there was a Pharisee, a man named Nicodemus who was a member of the Jewish ruling council. “A Pharisee” – the Pharisees were the most influential Jewish sect in Jesus’ time and unlike the more political Sadducees, held a conservative, fundamental theology – which could be too inflexibly ‘correct’ to accommodate the challenge of Jesus’ teaching. Nicodemus was also a member of the Sanhedrin controlling body which was generally antagonistic to Jesus. His cautious visit after dark – and as a person in some spiritual darkness himself – showed a genuine desire to find out for himself who Jesus was, while avoiding censure for meeting Him. “Very truly” – amen, amen. Jesus prefaced what He was going to say with the strongest emphasis. It was essential for Nicodemus to grasp this truth. It is essential for us. “Born again” – birth is how we enter this world, and spiritual birth is how we enter the spiritual dimension of this world. Nicodemus would have believed that to have been born a Jew was to be an inheritor of the kingdom of God. That is like us claiming that to be a churchgoer or have been through some religious rite brings us into the kingdom of God. “Very truly” v.5 below, we have to hear what Jesus says. “Born of water” – water cleanses from impurity and the Spirit transforms hearts. It cannot refer to things Nicodemus would not have understood, like Christian baptism, but must come from the Scriptures, which as a religious teacher he knew well. Water in the OT often refers to renewal or cleansing, Ezekiel 36:25-27. Everyone has had a start in life through natural birth, and everybody needs a spiritual birth, too. For further study: The Bible uses “born again”, “born of God” and becoming a “child of God” to talk about the same thing. John 1:12-13, Titus 3:5, 1 Peter 1:3 and 23, 1 John 2:29, 3:9, 4:7, 5:1 and 4 and 18. “You” – not just Nicodemus, everyone. Whatever language they were using – probably Aramaic – Nicodemus would have picked up on the allusion to ‘wind’ or ‘spirit’, which with ‘breath’ and ‘breathe’ are all the same word group in Hebrew. Jesus is telling Nicodemus that He is the living reality of the ‘life into dry bones’ prophecy of Ezekiel 37:1-14 (see TLW OT last week). For Nicodemus to be told that he, a prestigious and knowledgeable teacher, could not enter the kingdom of God based on his merit and good works, was shocking. If he could not, what hope was there for others? He knew the Scriptures, but his understanding of the Scriptures followed a framework of religious tradition. He had not come to an independent spiritual understanding of them. Hint: We need to delve into Scripture to check things out for ourselves. 13 No one has ever gone into heaven except the one who came from heaven – the Son of Man. 14-15 Just as Moses lifted up the snake in the wilderness, so the Son of Man must be lifted up, that everyone who believes may have eternal life in Him. “Lifted up” – we think immediately of Jesus’ crucifixion, but Nicodemus would not have made this connection until some years later. Lifted up, as in the bronze ‘snake in the wilderness’, Numbers 21:4-9, is also raising a symbol of judgment for people to recognise both the judgment and the deliverance. The crucifixion of Jesus is a picture of a terrible judgment for our sin, and also the deliverance. ; God grants spiritual, eternal life through Jesus who, unlike the bronze icon, has life in Himself, John 1:4, 5:26. Commonly recited as a procession sentence at Christian funerals. This is a key statement of the Good News. The Gospel is more than this, but this is a fundamental truth. “To condemn… to save” – The holiness and righteousness of Jesus shows up the selfishness and independence of the world, which is condemned already. But His purpose is to provide another way, as the bronze snake provides another way: believe, and live. Faith is not about doing, but believing. The choice is to believe in the Son and know salvation and eternal life; or to choose not to believe with the consequences of perishing – utter failure, loss and eternal separation. God’s love for humanity is such that He has “lifted up” and make plain, not just a symbol on a pole to help one nation to look to Him, but His unique Son’s life and death for the whole world to see, take stock and believe. An aristocratic Jewish religious teacher visits a rabbi with the calloused hands of a carpenter/builder and asks a question. The reply contains the most profound and most direct explanation of what the Good News is all about. It is a choice to see the kingdom of God – the way God’s order works – or not to see it, and it only comes by being humble enough to recognise the need for a new spiritual start. This is the new birth which so shocks Nicodemus. His worldview, like most Jews, was about merit and attainment. It was about living ‘a good life’ in the right religious way, and doing ‘good works’. If a person of such renowned goodness and achievement could not enter the kingdom of God, who could? Jesus’ answer is as difficult as it is disarmingly simple. It is about recognising that we cannot do anything of ourselves to secure salvation – no good works, no religious performance, no merit. It is simply about believing God, who must judge sin but who loves to save. We do this by receiving His Son Jesus as our Lord and Saviour. It is a gift which we can receive, but only by believing we need to receive it. The concept isn’t difficult – a child could get it. But the more we have set out to earn God’s favour, the more value we place on ‘our’ good works or achievements or religious obedience, the more baggage needs to be shed before we can come to the place of simply asking out of need. God loves the world just like He loved those errant and grumbling Israelites who were being bitten by a plague of deadly desert snakes. Would this get their attention? He devised a simple way for them to look upwards, and recognise the judgment but also see the source of salvation. Jesus used this example of Himself. His presence highlighted both where God’s judgment fell, and where God’s salvation was found. We choose for Jesus, His way and His kingdom life now and for eternity; or we choose our way, which is to perish. There is no ‘muddling along the middle’, because that is not choosing His way. Once we choose for Jesus, a lot that’s confusing becomes much more clear. We start to sense God speaking to us through His word, and in other ways. A weight drops off, and a light comes on… (Link to salvation prayer in May 13 post). Have you looked into the eyes of Jesus, recognised your need and received love? What changed for you? 9-11 You, however, are not in the realm of the flesh but are in the realm of the Spirit, if indeed the Spirit of God lives in you. And if anyone does not have the Spirit of Christ, they do not belong to Christ. “Have the Spirit of Christ… belong to Christ” – being brought up according to Christian values, or even attending church regularly, does not make us Christians, any more than frequenting the gym for coffee makes me a gymnast (or even fit). It is a decision to “belong” to Christ, as a result of which the Spirit of God comes to live in us and transform our human spirit. See note to vv.12-13 below. But if Christ is in you, then even though your body is subject to death because of sin, the Spirit gives life because of righteousness. And if the Spirit of Him who raised Jesus from the dead is living in you, He who raised Christ from the dead will also give life to your mortal bodies because of His Spirit who lives in you. “Spirit of God… Spirit of Christ… Christ in you” – the Trinity (God in three persons who are one) is not an explicit teaching in the Bible but a number of passages including this one make it clear, albeit indirectly. 12-13 Therefore, brothers and sisters, we have an obligation – but it is not to the flesh, to live according to it. For if you live according to the flesh, you will die; but if by the Spirit you put to death the misdeeds of the body, you will live. “To the flesh…by the Spirit” – the selfish human nature is contrasted with the Spirit-led nature which grows out of the new birth. Paul is referencing what he wrote earlier; Romans 8:1-8 explains this, especially verses 5-8. When we come to give ownership of our lives to Jesus, there’s a profound change spiritually: we become a new creation, 2 Corinthians 5:17. This new spiritual person grows around what God wants and the “what I want” part has less influence. Living by the Spirit doesn’t do away with the tendency to “live according to the flesh” but more and more, we don’t want to go there. We are putting it to death as we grow spiritually, Galatians 5:16-17. “Abba, Father” – Jesus used this form of address, Mark 14:36, which shocked religious Jews with its relative informality and intimacy. “Fear…adoption to sonship” – slaves lived in fear of arbitrary punishment as those without rights. The Greek-Roman pattern of adoption was often used to secure a male heir; at least one Caesar was adopted. Adoption conferred the full rights (and authority) of the son of an aristocratic family, without any of the stigma that we associate with it. Christians are not to live in fear of possible punishment, but in the security of being held by God’s love. “Children of God” – a profound privilege. Understanding this will transform the way you pray – and how you relate to God as a Father in every way. For further study, read John 1:12, Galatians 3:26, Philippians 2:15, 1 John 3:1, 1 John 5:19. 17 Now if we are children, then we are heirs – heirs of God and co-heirs with Christ, if indeed we share in his sufferings in order that we may also share in His glory. With the honour of sonship comes the responsibility. It’s a route that brings its attacks and difficulties. At these times we need the Holy Spirit’s nudge (v.16) and the fellowship of other Christians to remind us who we are and where our security lies. Paul’s point in this section of his letter to Christians in Rome, is that the way of life we have grown up with – from the tantrums of the “terrible twos” onwards – don’t just disappear when we become Christians. And becoming a Christian is a definite choice, a decision, at which point the Holy Spirit comes in and we take on a new persona. But the old, “me-centred”, and spiritually resistant person hangs on in there. We want to take our lead from Jesus, but it takes practice, faith by its nature has ‘unknowns’ which are challenging and the old, familiar tried-and-tested ways kick in too easily – “I’ll do it…I’ll fix it… I’ll make it happen. But if we have made a choice for Jesus to be Lord of our lives, then we are on a different track. The belonging and the Spirit’s leading are inseparable. We can’t have one, without the other. If we don’t know, then we should pray the prayer and make sure. And if we are sure, but ting confused about how we respond, or feeling the tug to ‘go with the crowd’, then the Holy Spirit will gently remind us who we belong to, the security we have in that sonship relationship and the help He gives us to do what Jesus would do. To be a spiritual person inside a human body will always feel like a bit of a hybrid, but we do have help – the best kind of coach – and we are empowered to make the good choices He shows us. p class=”p1″>How much do you have the sense of being led by the Spirit of God? What might be getting in the way?